Wind increasing. A mix of clouds and sun. High 63F. Winds WNW at 25 to 35 mph. Winds could occasionally gust over 40 mph..
Two Saturdays ago, the streets of Downtown Tehachapi were filled with patrons at Main Street Tehachapi’s Annual Ugly Sweater Wine Walk. The fundraiser, which invites attendees to walk through our thriving downtown and sample wine and food from local businesses, sold nearly 500 tickets and was a huge success. Reports from local businesses also drew praise for the number of visitors and new residents who were enjoying the festivities. They found this out because in typical Tehachapi fashion, they struck up a conversation and asked. It's a novel concept in an age when most people would rather avoid a stranger than get to know one. It got me thinking about one of my favorite George Strait songs, "There’s a Difference In Living and Living Well.” You probably know the words; essentially “King George” is telling us that while we can live on our own, “something’s always missing ‘til you share it with someone else.” I feel the same about our lifestyle here in Tehachapi. Those visitors who were enjoying the Wine Walk came here to experience something different, and I’m sure they left satisfied. Those visitors are the same people who file Tehachapi into their minds and then one day, circumstances allow them to move here, and enjoy this lifestyle full-time. It’s something we should all be proud of; we continue to be a place where others choose to relocate because we’ve built something special in our community. Local leadership needs to take that into account as well. This is why the importance of planning for proper growth, adhering to standards of development and cooperation within the region are priorities at City Hall. We understand that what we have is valuable, and in order to retain that value, we have to ensure our community continues in the right direction. We adhere to the community master plan that was adopted several years back as a result of input from our residents. 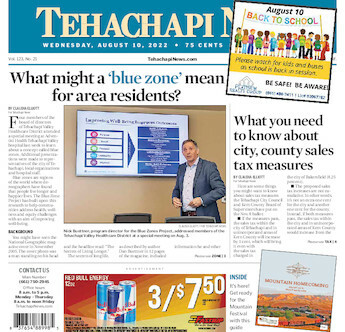 It provides the road map to how we will grow while protecting the sanctity of what makes Tehachapi so special. George Strait tells us that “you can’t have it all, all by yourself.” I think that’s a profound statement, especially as it relates toTehachapi. Our influence in the region, our economy, our way of life is something to be treasured, and while some understandably wish to hold on to their piece of that, it’s become more commonplace to share it with others by being prepared and continuing to move forward in the way we do business. I ask for your involvement and feedback as we continue to share what we have with new neighbors and new friends. We ask for input on major projects, public comments at meetings and of course I am happy to answer questions and concerns via email at ggarrett@tehachapicityhall.com. Greg Garrett is Tehachapi's city manager. The opinions expressed are his own.